When faced with the mocking rants of atheists and God-haters, our natural temptation is to dismiss them as ignorant bigots or to get angry. But that’s not Christ’s way. Christians who follow the Lamb’s example will find His Spirit shedding light in the most unexpected places. Recently I was asked to watch a TV show that I would otherwise never have turned to. The show is hosted by two illusionists, Penn & Teller. Talented but very crude. I reluctantly viewed two episodes poking fun at creationists and the Bible. My goal was to pull out their specific arguments and prepare responses that I could use in my worldview talks at churches and conferences. “These guys are just big pigs!” I thought. How wrong I was! 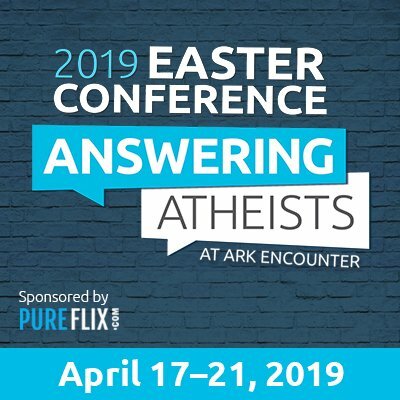 Shortly after evaluating this program I saw another short video where Penn (full name, Penn Jillette) shares about his encounter with a Christian man who gave him a gift after one of his shows. Following are excerpts and some valuable lessons about how to share our faith with an atheist. He was there the night before and came back. How many times have we passed up an opportunity to share the gospel with someone? Remember this, we can usually go back. The Christian complimented the atheist’s gifts instead of attacking his weaknesses. I can see you chuckling now, but don’t mock. Anyone could easily misspeak. Even if your listener doesn’t know that Psalms isn’t in the New Testament, he deserves patience and respect. This Christian man wasn’t intimidated. He opened his mouth and shared his faith, knowing how Penn felt about Christians and the Bible. Oh, how we need such boldness! Wow! I’m so embarrassed. I wouldn’t have spoken with this foul-mouthed atheist, much less given him a Bible. Penn was encouraged by this man’s boldness. He wasn’t defensive or attacking. Did you notice the phrase “he looked me in the eyes” repeated three times? This is so important. He talked “to” him, not “at” him. Yes, there is a major difference. Check your motivations! This man cared, and it came through clearly. If the Christian’s motivation had been to show the atheist how wrong he was or to just win an argument, those motives would have been just as clear. How about two, three, maybe four people living right? What if every Christian exuded this type of concern? Even though Penn didn’t “convert,” that’s not our concern. Our job is not to convict or convert. That is the Holy Spirit’s job. Our job is to converse (Mark 16:15). Christians must become more visible in the culture. We’ve been hiding our light under a basket far too long. Please read and reread Penn’s last quote carefully. As part of my talks all across America, I now show footage from this interview with Penn. This message needs to be preached in pulpits everywhere. If we say we love Jesus with our mouths, our actions should also reflect that love. To quote a friend, “Jesus paid much too high a price for us to pick and choose who should hear the gospel” (Romans 10:14–15). 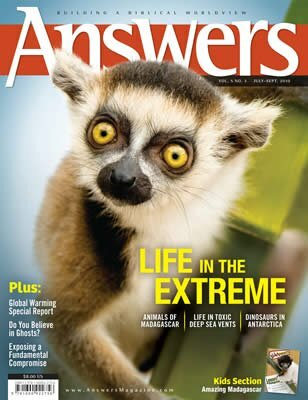 From subtropical Madagascar to Antarctica, from frozen deserts to poisonous submarine volcanoes, creatures seem to inhabit every corner of the globe. How can they survive so well under so many different conditions? This issue includes a special section that examines life at the extremes, where God’s creative power continues to astound and delight us!